About a year ago, we got this cool new cell-phone game camera – the ScoutGuard SG550M. A cell-phone game camera is one that texts and emails you when it takes a picture, at least theoretically. Well, we had some issues with it and it laid around gathering dust for a while, but we finally got it to work last month! Here is the first official photo it took, sent to us via email and text. So why is this so nifty, aside from the cool technology aspect of it? 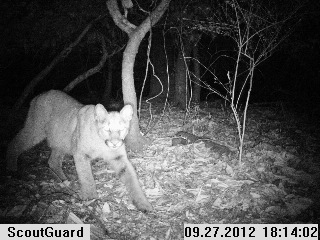 Well, having these cameras will allow us to keep much better track of pumas when we’re trying to capture or track them. For example, if we set a cage trap for an animal, this camera will alert us right away if the puma shows up. Currently, we have one field personnel check the trap signal every half hour and then alert us. With this new camera, we can now respond more quickly and efficiently to a captured puma and hopefully reduce the amount of time it spends in the trap. Of course, there are also drawbacks to this technology. Since it runs on a cellular network, it needs to have reception to work. In addition, we are on a limited data plan, so we can only receive a set amount of photos each month before we have to pay a lot of money to the phone companies (you know how that goes). Nevertheless- we are still excited to test this new camera out now that capture season is getting underway!